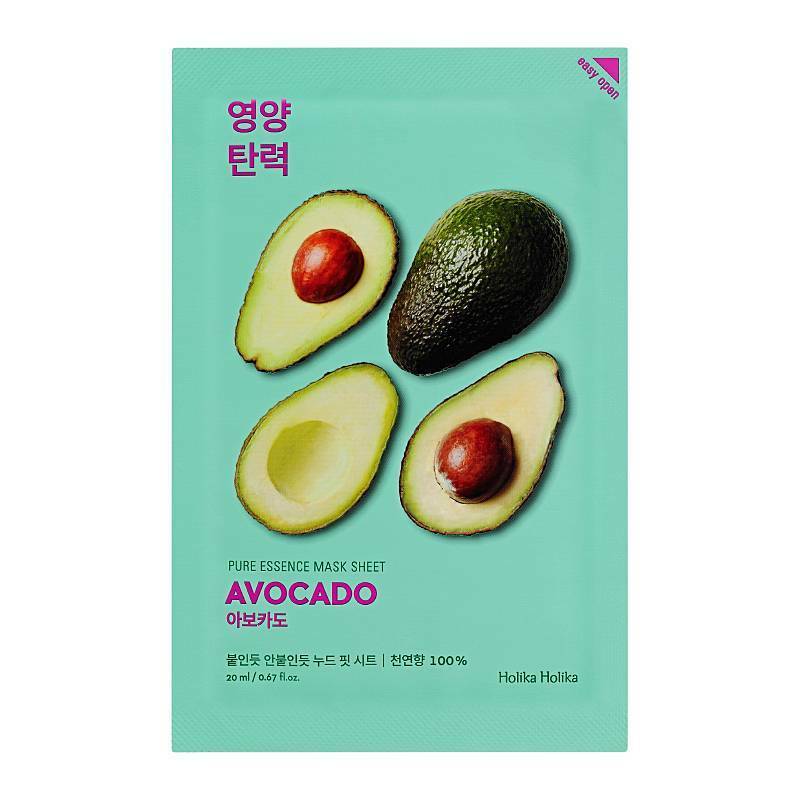 This mask contains the pure essence of avocado. This mask intensely softens and nourishes your skin, restoring the skins elasticity. This is the perfect mask for when your skin has been exposed to windy weather. 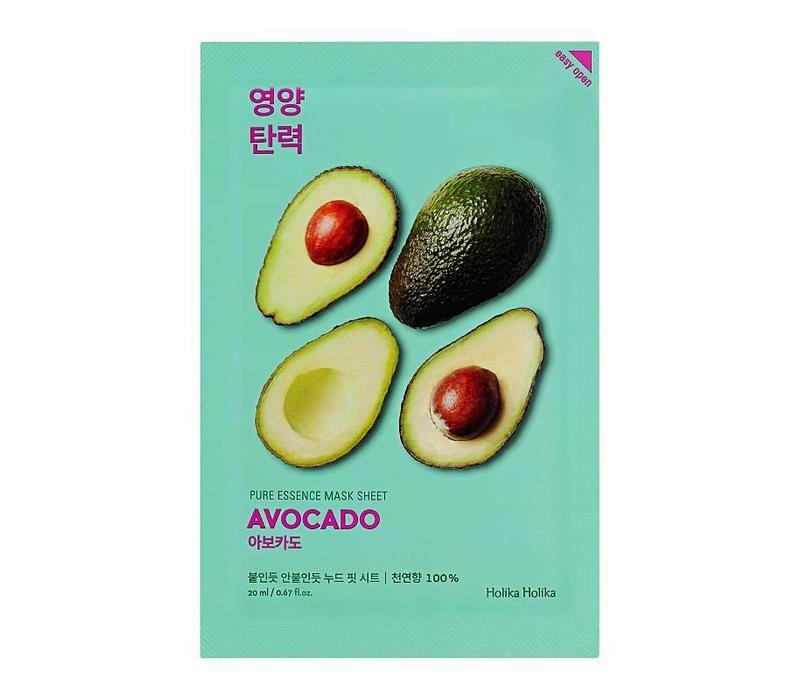 Holika Holika Pure Essence Mask Sheet Avocado contains the pure essence of avocado. This mask intensely softens and nourishes your skin, restoring the skins elasticity. This is the perfect mask for when your skin has been exposed to windy weather. The formula actively combats dryness, reduces inflammation and redness. Avocado extract deeply nourishes your skin and makes it silky soft. Milk proteins nourishes and repairs the protective barrier of your skin. Hyaluronic acid gives your skin a moisture boost. Intensely softens and nourishes your skin. Apply mask on cleansed skin. Gently massage left over essence into your skin. Avoid contact with your eyes and don't let the mask dry completely on your skin. Water, Dipropylene Glycol, Glycerin, Polyglyceryl-10 Laurate, Butylene Glycol, Centella Asiatica Extract, Paeonia Suffruticosa Root Extract, 1,2-Hexanediol, Hydroxyethylcellulose, Chamomilla Recutita (Matricaria) Flower Extract, Persea Gratissima (Avocado) Fruit Extract, Glyceryl Caprylate, Arginine, Carbomer, Adenosine, Ethylhexylglycerin, Xanthan Gum, Allantoin, Milk Protein Extract, Sodium Hyaluronate, Citrus Aurantium Dulcis (Orange) Peel Oil, Olea Europaea (Olive) Fruit Oil, Viola Tricolor Extract, Lavandula Angustifolia (Lavender) Flower Extract, Centaurea Cyanus Flower Extract, Avandula angustifolia (Lavender) Oil, Ocimum Basilicum (Basil) Oil, Pelargonium Graveolens Flower Oil, Disodium EDTA.